A selection of pictures of the Citadel, a fortified area on top of a hill in Cairo, which has been home to Egypt's rulers for some 700 years. Saladin began fortifying the Citadel in 1176. 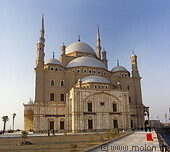 The Mohammed Ali mosque was built between 1830 and 1848.